is equipped with 2500W powerful brushless motor and LONG piston rod, similar to Ultramax 1595 & Mark X. Designed for everyday use on all residential, industrial and commercial applications spraying with one gun or two. Suitable for professionals spraying all kinds of materials, such as Lacquer, Latex, Sealer, Varnish, Water-Based Paints, Oil-Base Paints, Exterior Stain, Multi-Color, Block Filler, Elastomerics, Epoxy, Dry Fall / Fog, Mastic, Spackling, Putty, Dry Wall Mud, Putty Plaster, Roof Coatings, etc. With spray gun(1pc tip guard + 2pcs tip #531/#541), 3/8”NPSM*15m hose, 1/4”NPSM*1m whip hose. 1. Low Positon Suction Valve, Long Piston Rod. fireproofing / anti-corrosive paint / emulsions and fillings etc. constant spraying pressure with low pulse and tight pressure deadband (5%). generate the fast response when spraying. no spark during the spraying, the oil paint or the flammable paint will be no problems. totally clean your machine quickly and efficiently. for reducing the wear of the piston rod&V-packing. Digital display for pressure which is easy for reading during the painting job. 2 guns is available at the same time for the painting job, with higher efficiency. Do you have agent in Hungria? I want try your machine, could you send me the quotation of the piston pump and gasoline sprayers? Thank you! hi, we are paint contractors and we are interesting in model no. 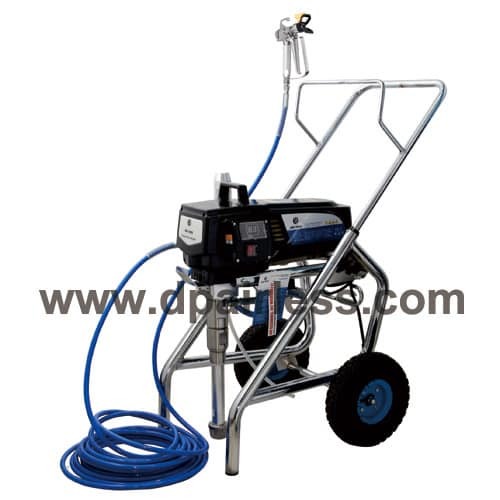 DP-6337 ib, if you do not mind send us extra information if this machine can spray epoxy solvent base material. plus fob price to Kuwait, thanks in advance. This device i want to try on their work.On plaster.different painting.And need primers and shipping to Ukraine. Hellou. Hoy much 1pcs? 220v/50h.Hoy much is sent to the Ukraine and were and it occurs.